In talking about Bill’s garden I briefly mentioned the artwork, the wood carvings, the birdhouse, that John contributed to the garden. Though it may be hard to see there is a lot of detail in his work. Did you notice the actual bird house is in the shape of a bird’s head? 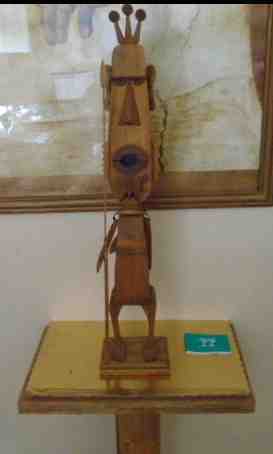 With the exception of the first piece which is in his apartment, and that someone recently bought, John’s work can be seen all over Gateway, not necessarily in the form of wood carvings but in the fact that he is very handy and has done a lot of work for residents to make their life easier from putting up shelves to even making a bed. 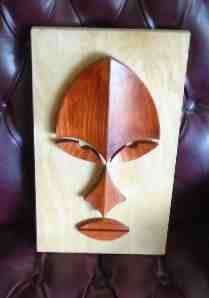 I don’t know whether it is recent or he has been doing it for awhile but a lot of his art is African oriented. Before I put the dresser in front of the east window in my living room with a ‘door’ on top to display my plants he had extended the two window sills by putting a wider shelf on each. When I decided to stop using my oven/stove top he had the idea of using an old cupboard shelf so I could put my blender, crockpot, electric can opener and coffee ingredients on top of it. Along with that he put up my blackout drapes in the bedroom. He has made shelves for people to put their microwaves on and right now is working on an open floor cabinet, like I have in my kitchen, for someone else. I know he has done a lot of work for others here and he basically just charges for the materials he has to get and throw the labor in for free.